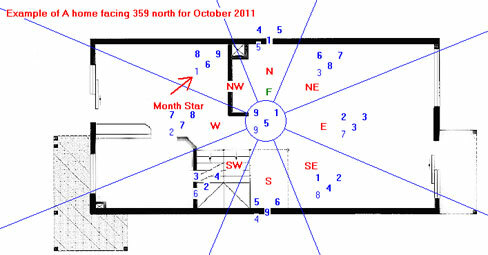 We will be adding the Flying Stars for October 2011 shortly. This is only a general perspective guide for the twelve earthly branches of the Chinese almanac for October 2011. In this, I have attempted to point out the factors that may affect you beneficially this month and also those of which you should beware of according to your animal sign. The effect on individuals should be considered within the context of the monthly Flying Stars for October. Please do not think that because, for example, you are a Dragon and you read below that October 2011 will not be so good, you will therefore have a bad month. No, a positive attitude and hard work combined with knowledge of what the month ahead has in store for you will enable you to avoid many problems and disappointments. Be very careful on the 3-9-16-21-28- October as these are either year, month or sha days and not good at all, so please do not plan any important tasks for these days. If you would like to be better informed of good and bad days check our free monthly almanac or our powerful date selection Tong Shu almanac software. Events will flow smoothly for Rat this October as long as you keep a low profile. If you do not, the elements will work against you which may well result in you suffering setbacks and difficulties in your endeavours both at work and in relationships. You can look forward to an auspicious month in September as long as you learn to avoid arguements and are able to stay at peace with everyone. Although the month of October will be overall good for you, it would work in your benefit if you stay away from arguements as they may quickly escalate in to something more serious. It will be of benefit to you if you learn to forgive others in October. Overall, this will be a good month for you but please remember to avoid disputes. This month will be a great month for the tiger especially involving work and wealth, although you should try not to get sidetracked by becoming involved in the schemes of others, especially in the workplace. Select your friends sensibly and at some time this year you will find who your true friends are, this will be a good time for you. You need to be careful of what you eat and drink especially as some of us become a bit less active as the weather drops in certain countries. Enjoy a great October, this can be a very good month for romance. You can look forward to an auspicious month in October. Your guardian stars are shining protectively over you dispersing many of the difficulties or mishaps you may have encountered the last months. You may find that pretty much everything you attend to goes very smoothly this month and you should try to take advantage of this and try to get as much done as possible. Nothing much will be achieved this month although that does not necessarily mean you will have A bad noth. You may find that plans and goals may not develop as planned or plans get changed suddenly without prior notice or indication which may become very annoying. Don’t get yourself too upset if the changes are only a matter of schedules. Just remember to stay focused and flexible at the same time. Be sensitive with friends and family and do not turn your frustrations into problems with harsh words which will certainly bring regrets. This can be a good month if you sit back and let things pass. Snake affairs will run smoothly this month but you should not get too uptight because of the perceived incompetence of others. This is a good time to make a purchase that you have been putting off for a while as this can help to avoid an unwanted loss of money. When a bad thought enters your head or you have an opportunity to receive some money or belongings that do not belong to you please remember whatever you give in this world comes back good or bad. It will be a good month overall and all may seem well but there may be problems on the personal and relationship side if you are already in a relationship. Pay particular attention to your partner or loved ones as whilst the month will seem much better than previous months it can make you forget about the people who have supported you over the year. For protection against psychic forces wear some hematite beads or amethyst. For single Horses it should be a good month for romance so expect some good news. Arranging outings or holidays with their family may help improve the health and quality of family and love life. This is a month to pay special attention to your health and work life so please try and take time out to rest especially if you are an older Goat. It is not all bad though as you could receive some unexpected good news. You should be careful as there is a risk of cutting yourself in October do try to avoid sharp objects when unsure. Do not panic when you are met with difficulties. With patience, the worm will turn and all will be well. Be careful with overworking this month, easpecially towards the end. This is a steady month of progress and the Monkey has the opportunity to enjoy quality time with those around them. Wealth luck is good and as long as you work within your means, you can safely put your investment plans to work. However busy you are, do not neglect family life or friends. You have further good months to look forward too as well. October will be good although do not get distracted by becoming involved in the schemes of others at work. You must be true to your principles and success, whether in the form of promotions or recognition will be yours. Should you decide to help someone in need, you must refrain from getting emotionally involved in your dealings with them. Choose your friends wisely and at some time this year you will find who your true friends are, this will be a good time for you. Events will flow smoothly for Dog this October as long as you keep a low profile. If you do not, the elements will work against you which may well result in you suffering setbacks and difficulties in your endeavours both at work and in relationships. When dealing with people try and keep your emotions cool as your hot head can get you into deep trouble, so a diplomatic approach is needed this month and really throughout the year. You may find that pressure at work may be high this month and you seem to be running around in circles not getting anywhere or anything done. Don’t stress yourself out as worrying will not help you and is a waste of energy. All you’ve got to do is to do your best and wait, it really will not be as bad as you think. Take rest and time out for yourself, maybe even book a holiday for you and your family. Do not demand too much of yourself. Wealth aspect is not ideal either. I hope you have enjoyed reading this information. As I said at the beginning, if the prediction for your earthly branch (animal) is not so good this month, you can avoid any potential problems by following our advice. Good luck and have a wonderful October. To further ensure a smooth month ahead and for more information on the monthly Almanac Sand choosing auspicious days follow this link. Copyright law protects this material. We are more than happy to share our content, all you need to do is ask our permission and agree to give us credit for our hard work and a link back to our website. Contact Michael@fengshuiweb.co.ukfor more details.